Helpful to read the "Getting Started", "Helpful Hints", and "Assumptions" tabs under the Help menu before using the simulation. Provide some starting points for exploring the relationships displayed in the simulation. Educators might need to review Earth's energy balance and note that the energy that is emitted from Earth is longwave radiation. Great visualization of 8 different greenhouse gas IR spectra (H2O, C3F8, O3, CFCl3, CO2, CH4, CF2Cl2, N2O) showing their relative intensity v. wavelength. 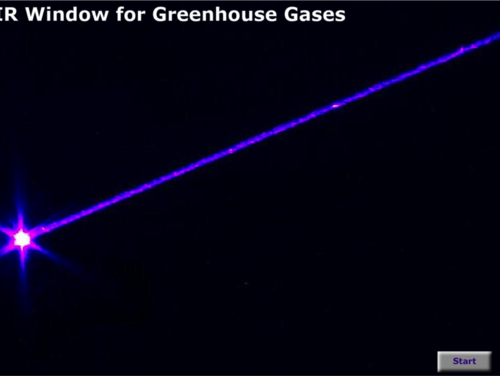 Well-designed animation that allows students to view the molecular structure of greenhouse gases and their absorption spectrum. Animation provides background information to understand the significance of infrared absorption. The information provided under the Help menu could be used as a start to guided questions or further exploration; however, outside research and basic understanding of the topic might be necessary to use the simulation to its full potential. Animation facilitates understanding about absorption of infrared radiation. No framing questions provided with this animation, but they can easily be designed. Lesson for which this applet was designed can be seen at [link http://www.explainingclimatechange.ca/Climate%20Change/Lessons/Lesson%20..., also found in the CLEAN collection. Can only be viewed online.